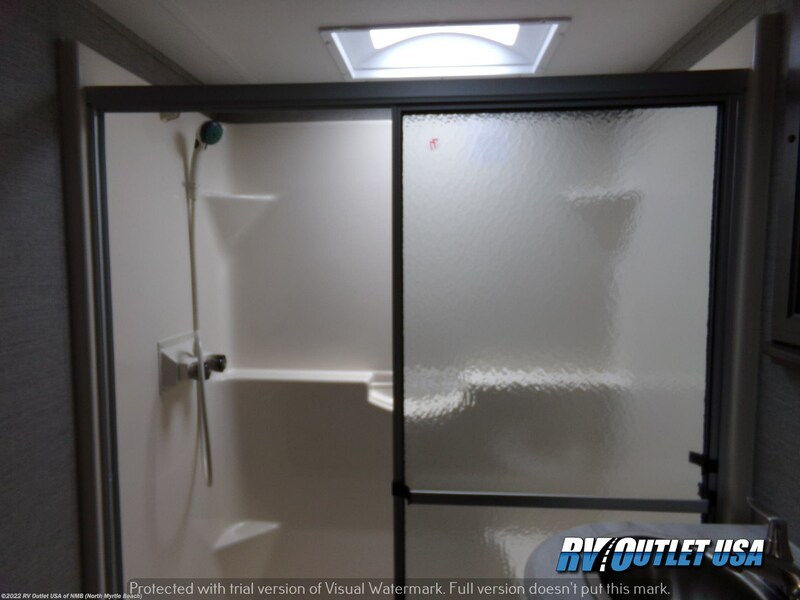 BATH AND 1/2 ** (2) AWNINGS ** (4) DOOR REFER! 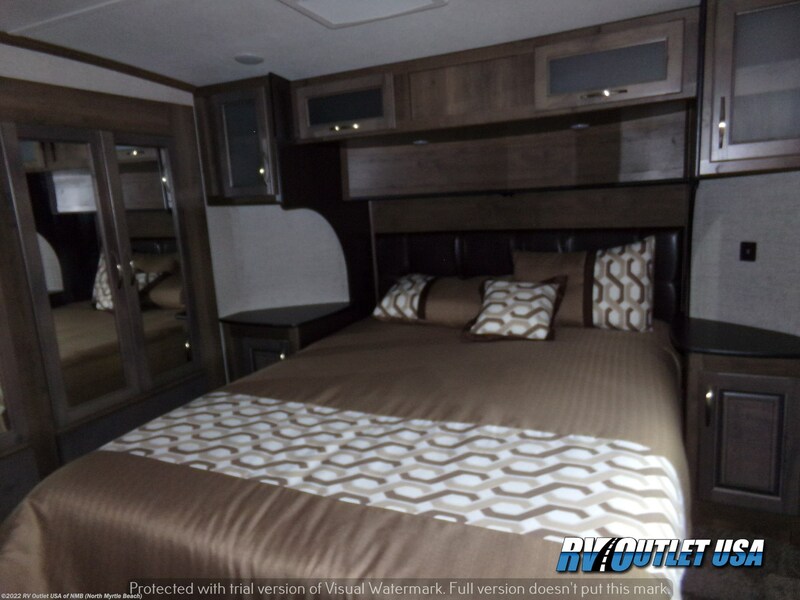 LEVELING SYSTEM ** QUEEN BED MASTER SUITE! 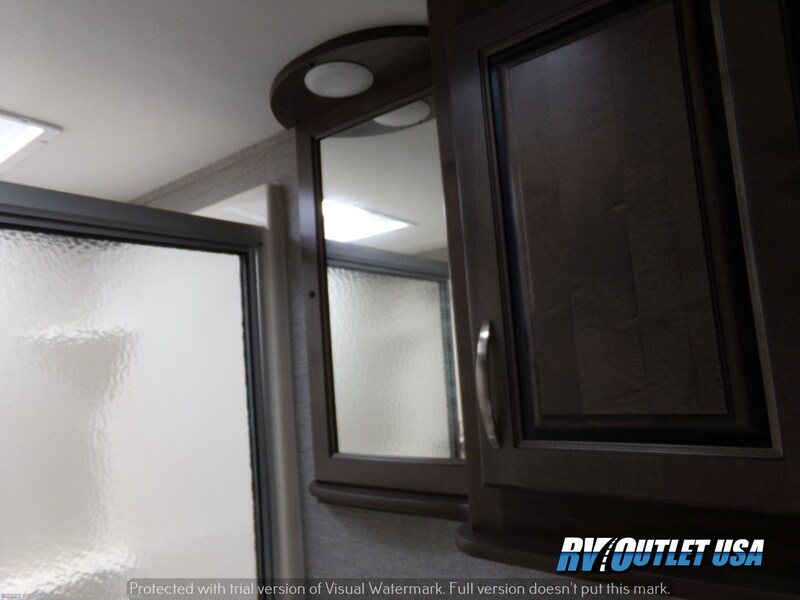 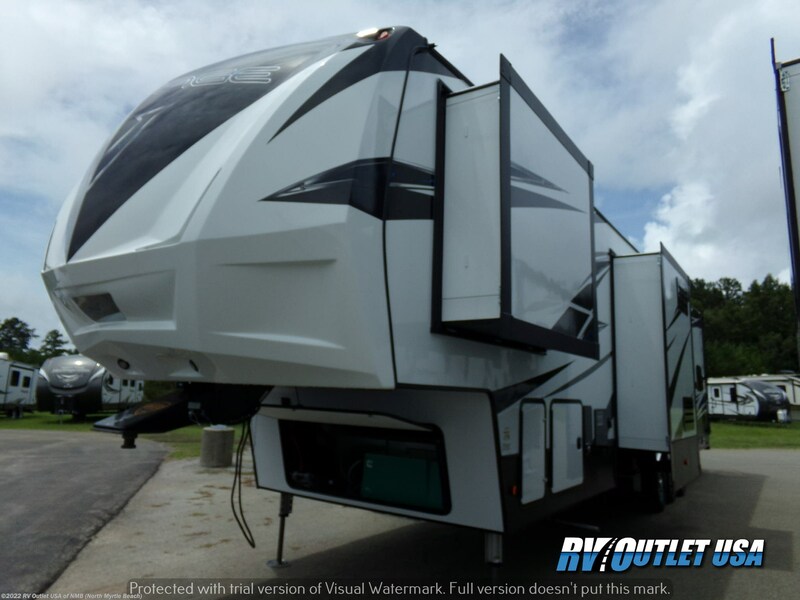 Introducing the brand new 2019 Dutchmen Voltage 3805 5th wheel toy hauler! 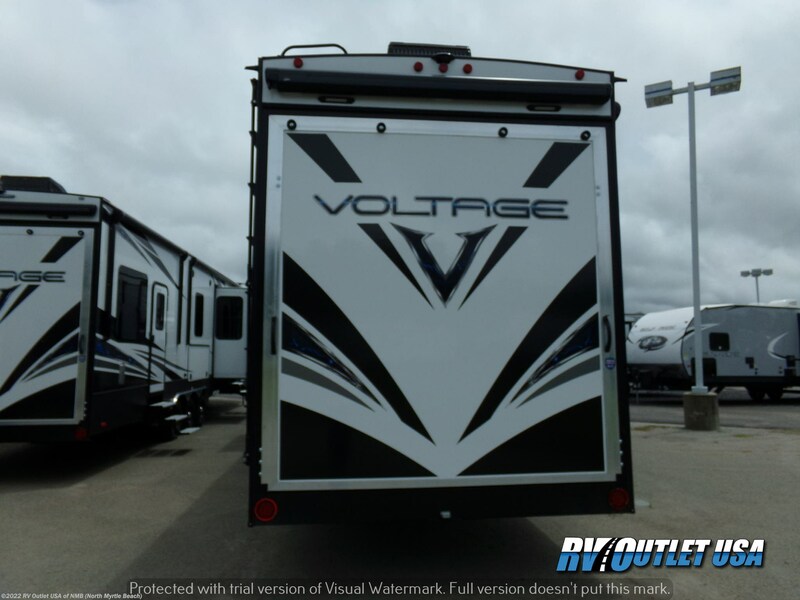 This is the brand new look for Dutchmen Voltage!! 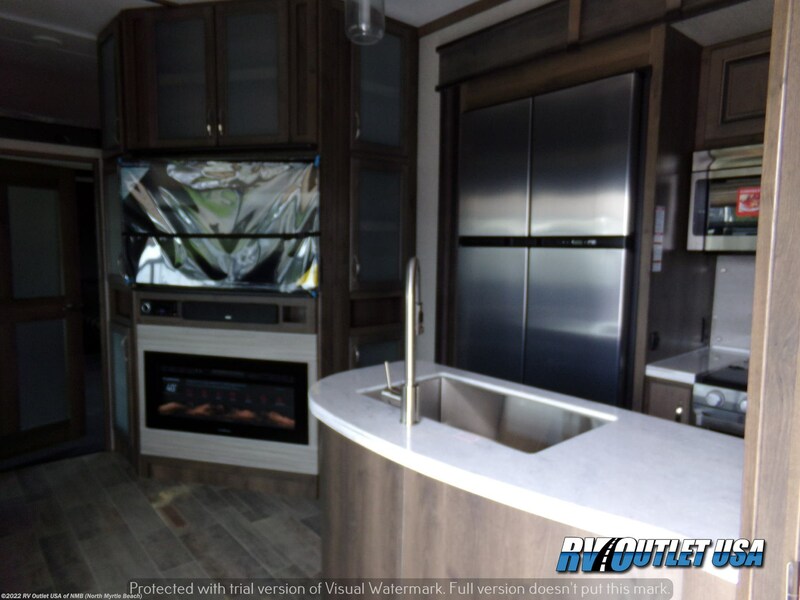 The new painted front cap, high gloss exterior sidewalls, some of the coolest exterior graphics on the market today, and the brand new Walnut cabinetry, and that's just to name a few of the upgrades! 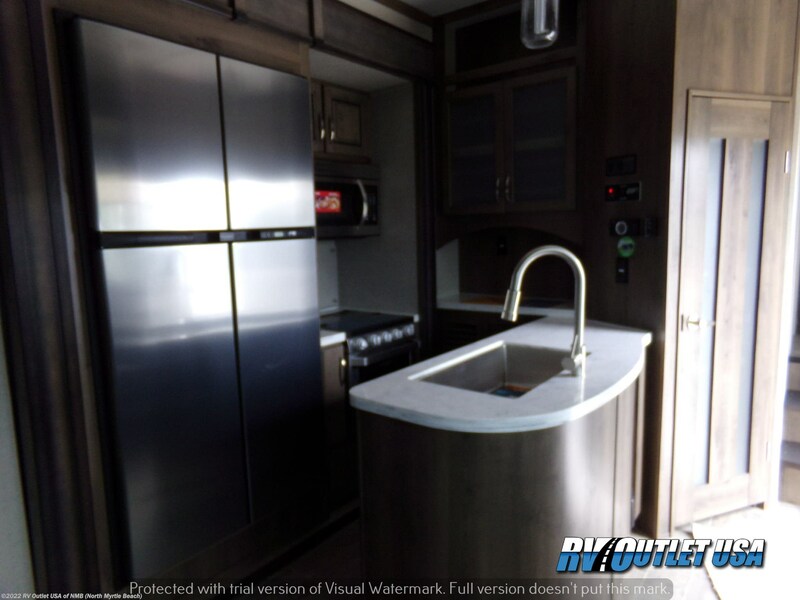 This is one of their best selling floor plans because of it being 42' long, having (3) slide outs, it's a bath and 1/2 floor plan and it's a double axle toy hauler. 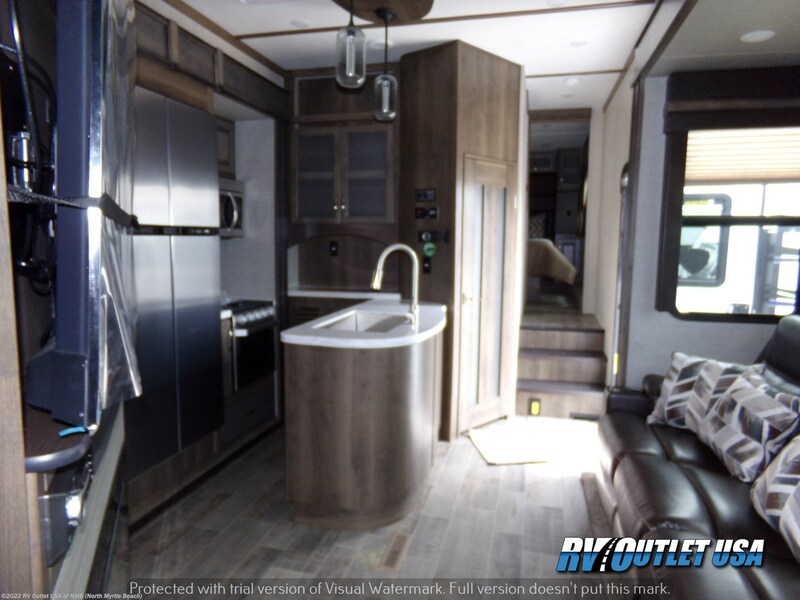 Plus, this 3805 has the Voltage Luxury package, the Voltage Interior and Exterior packages and the Voltage Convenience package! 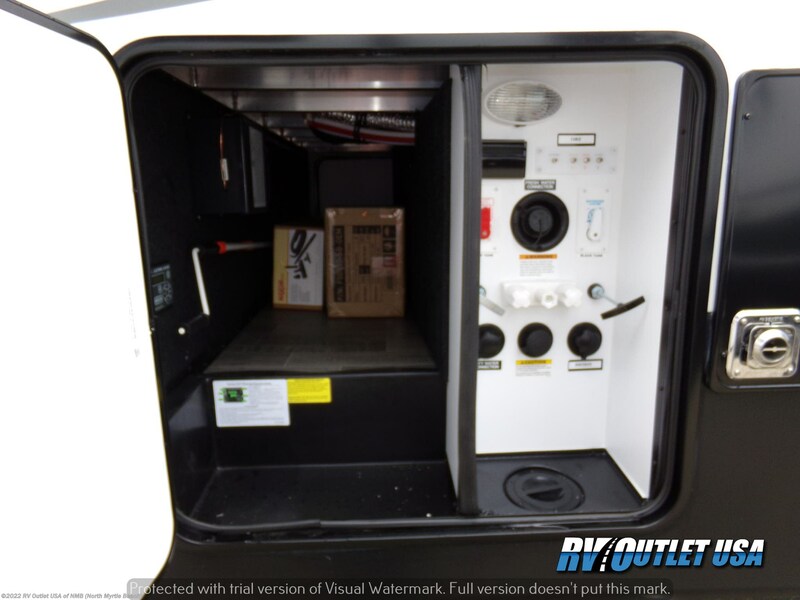 These (3) packages contain a TON of very nice features! 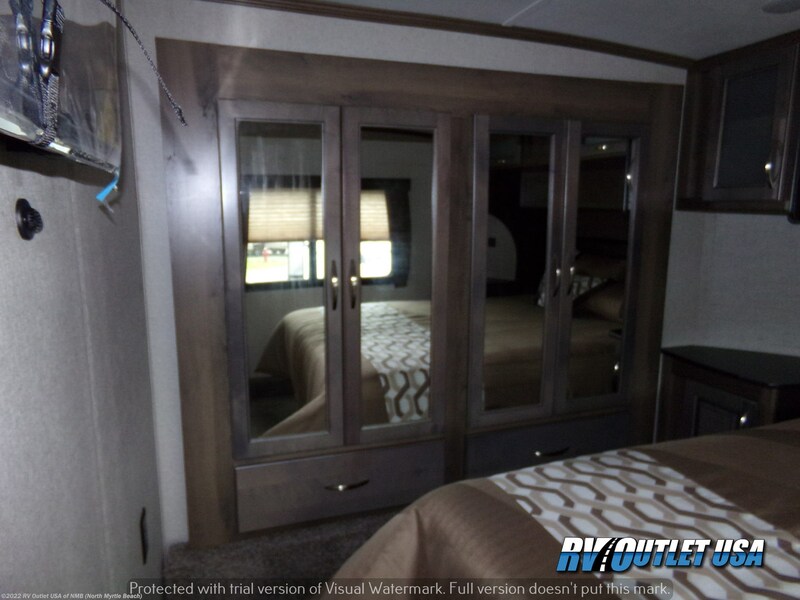 This floor plan has a walk around Queen bed master suite with a wardrobe slide on the off door side. 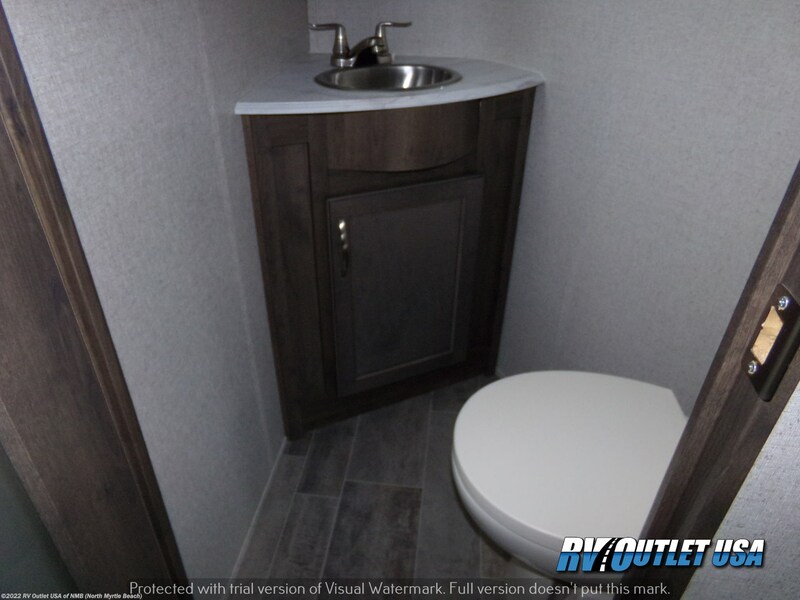 It also has a side aisle bathroom with a large shower (which is big enough for (2) people to stand in at one time), a porcelain foot flush toilet and a sink with vanity and medicine cabinet. 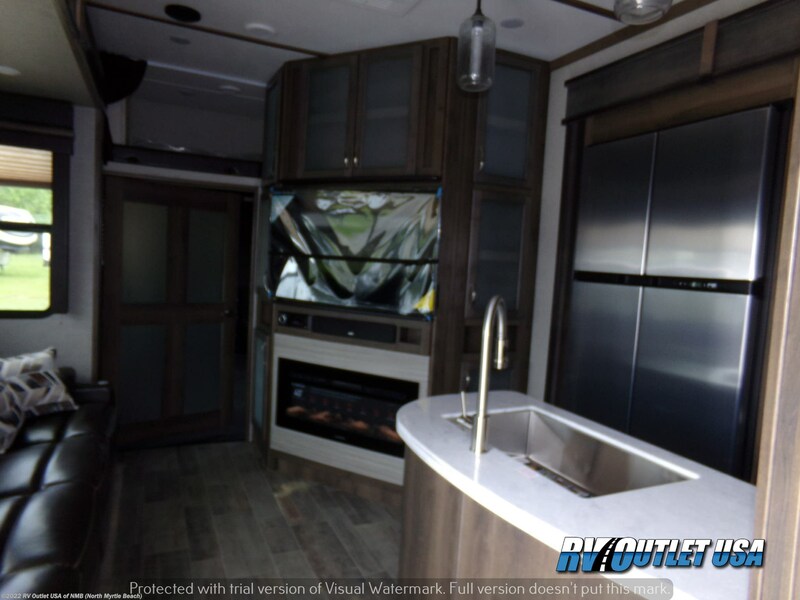 I really like the way they designed the living area on this toy hauler as well. 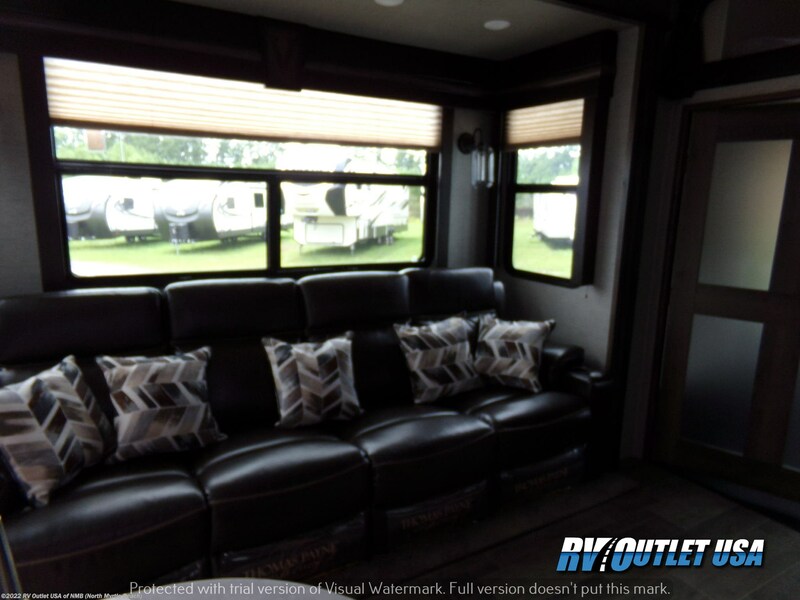 On the door side, you'll find a huge sofa lounge which faces the LCD TV and below that is a super nice, rocked fireplace! 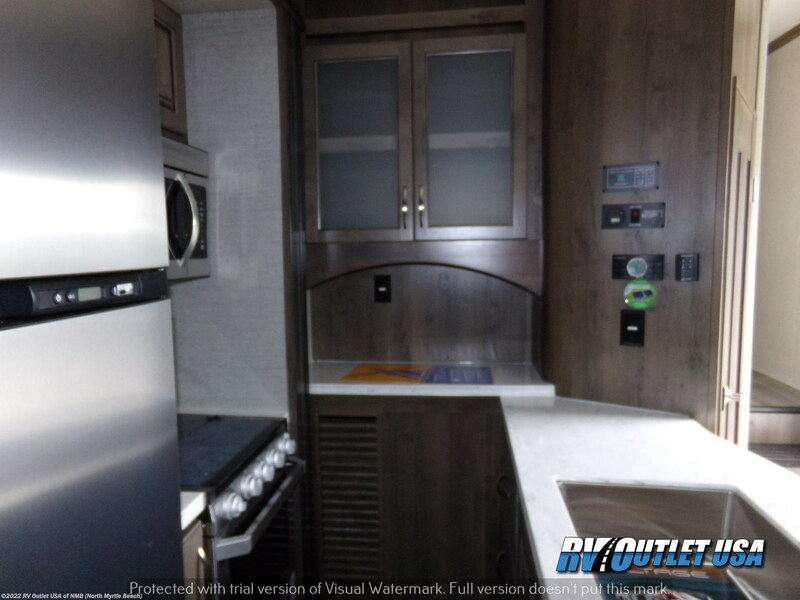 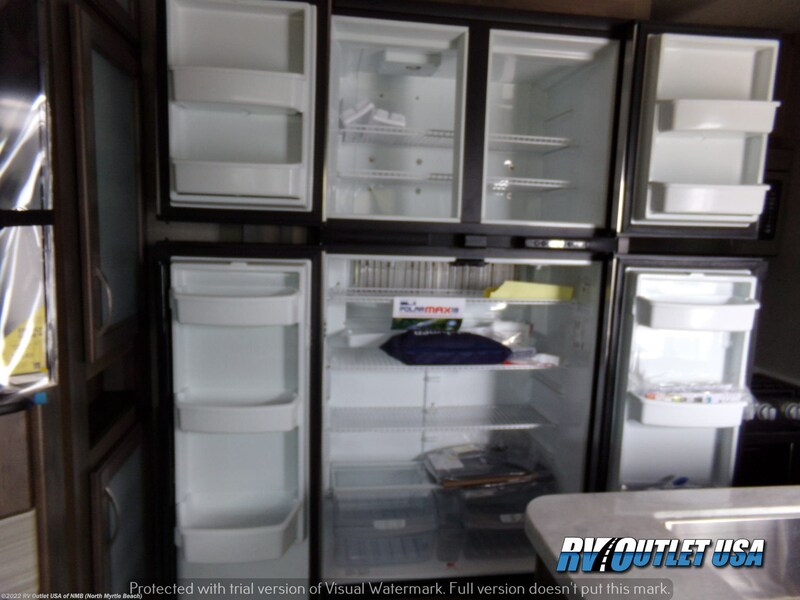 The slide on the off door side is a galley (kitchen) slide and it has a (3) burner stove top, an oven, a microwave oven with an exhaust hood and the ever popular (4) door refer. 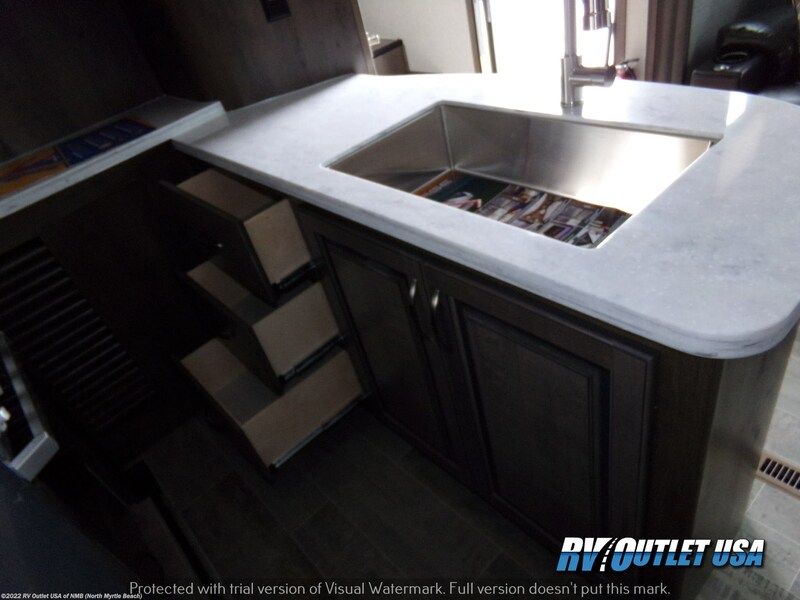 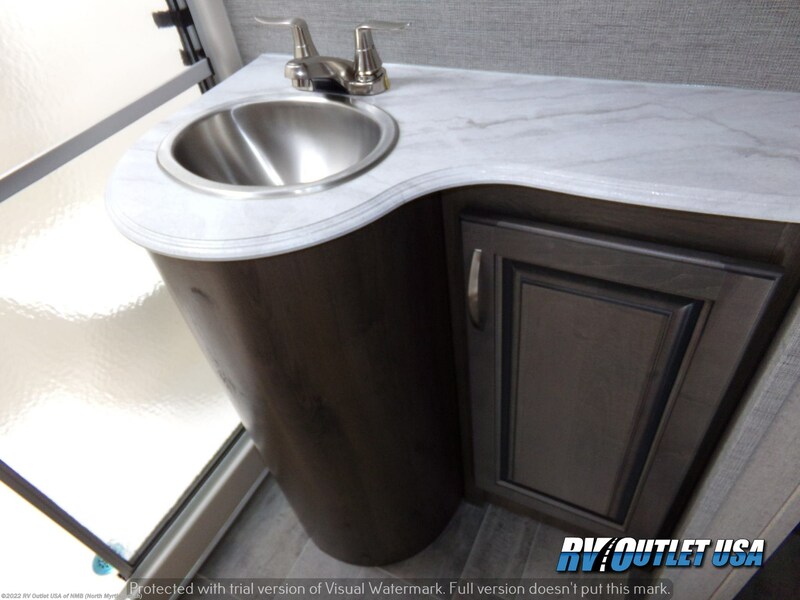 It also has a solid surface counter top that comes off the bathroom wall which has the double stainless sinks, and it has several drawers and a ton of storage! 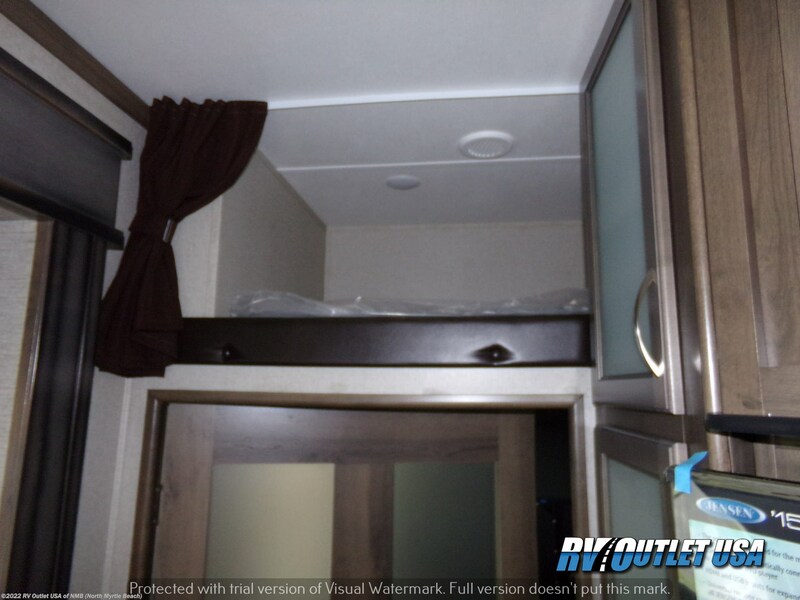 The 1/2 bath is behind the wall where the TV Is located in the living room and it has a loft bed for extra sleeping room or storage. 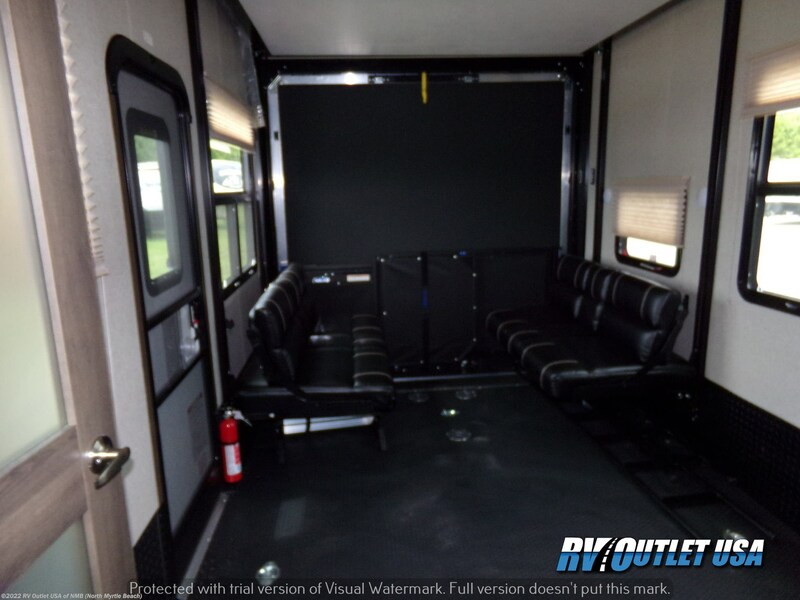 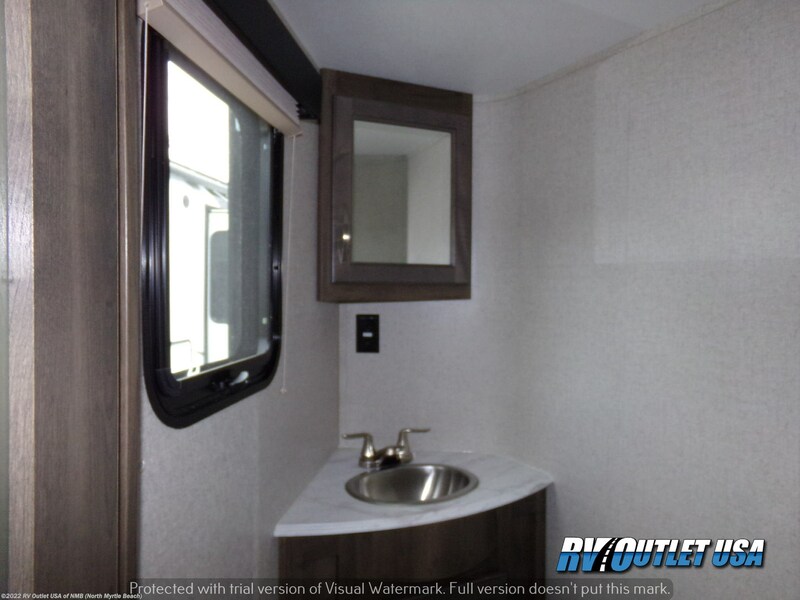 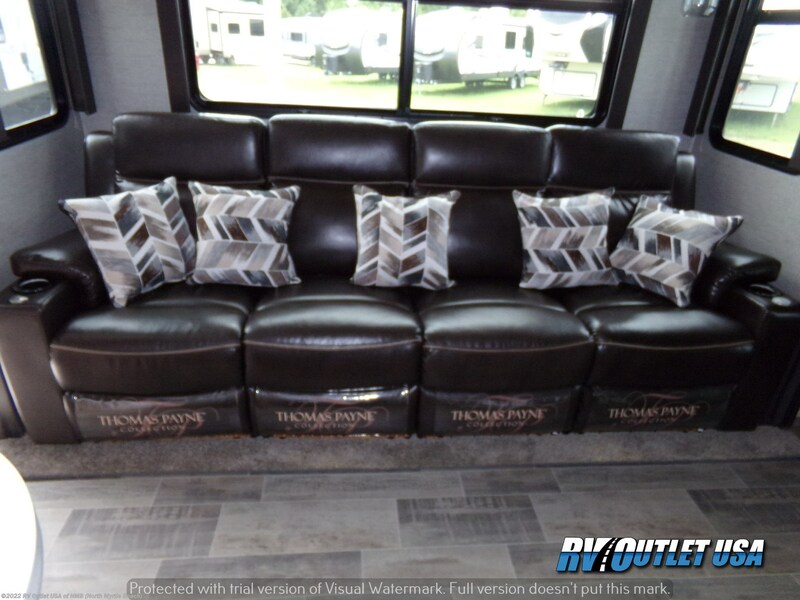 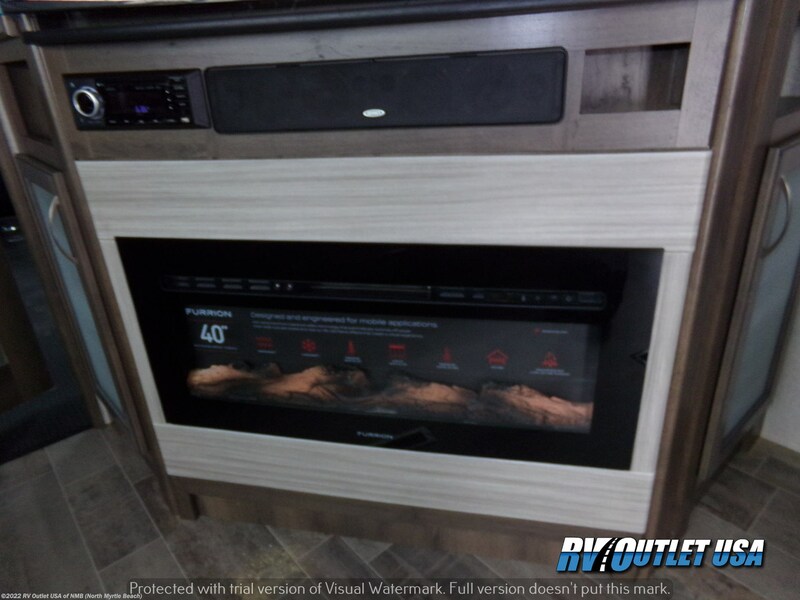 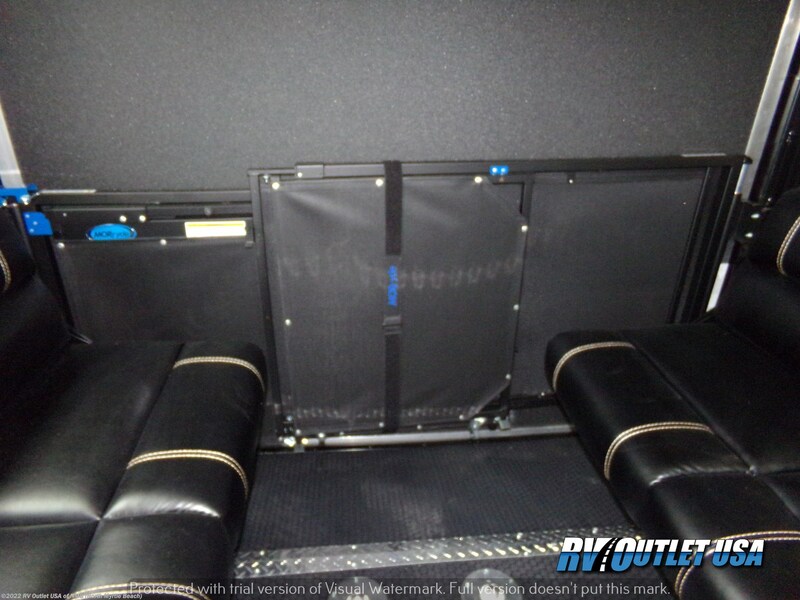 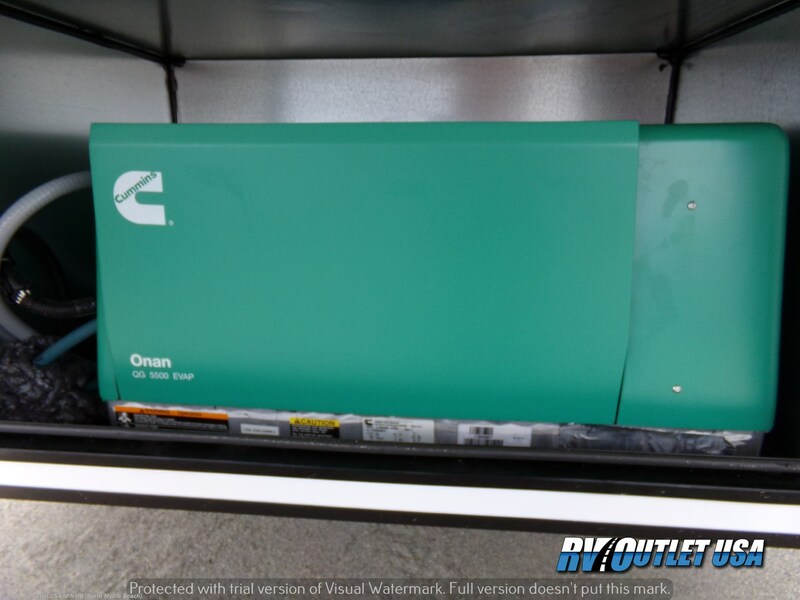 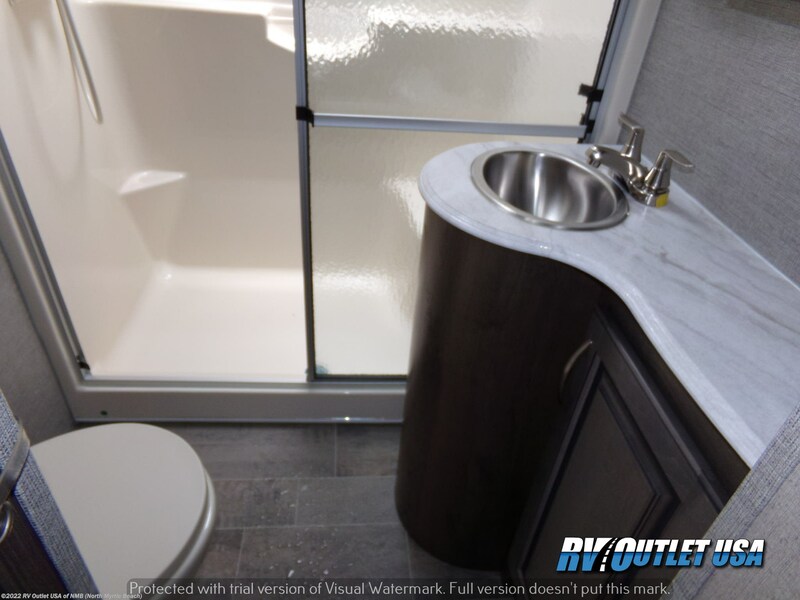 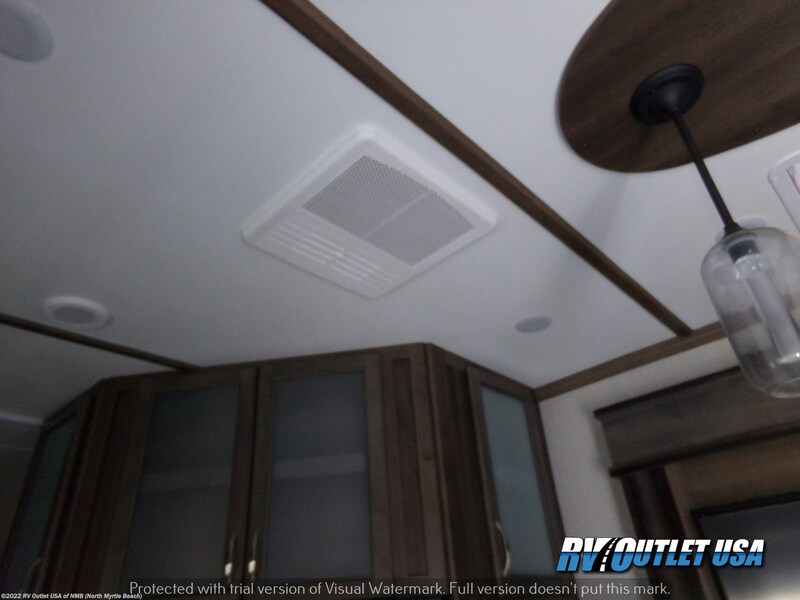 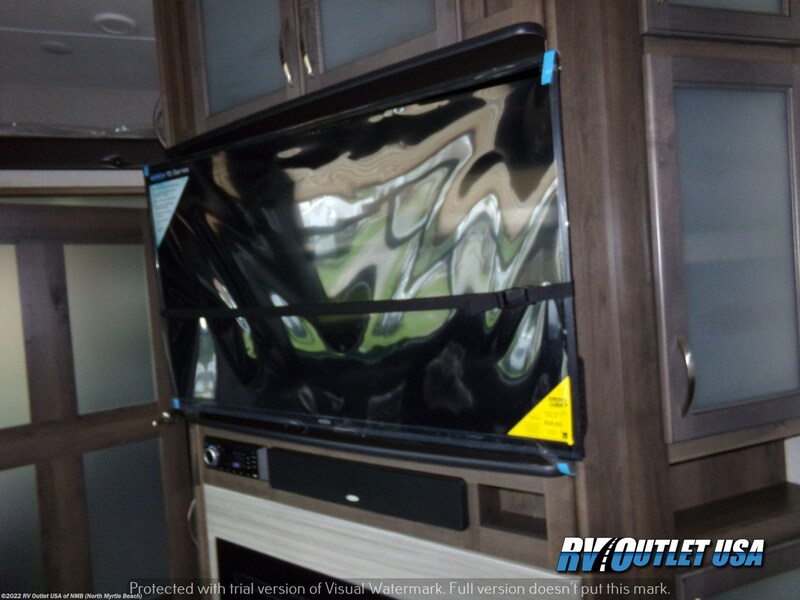 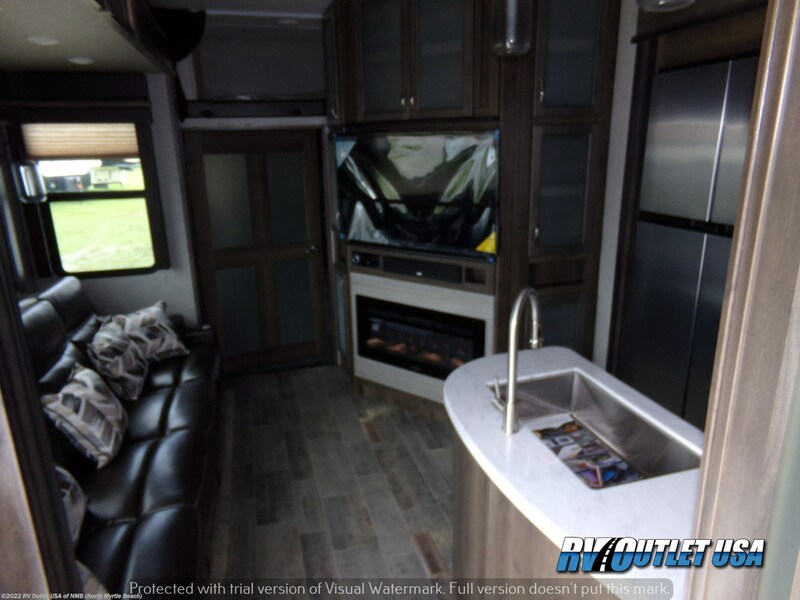 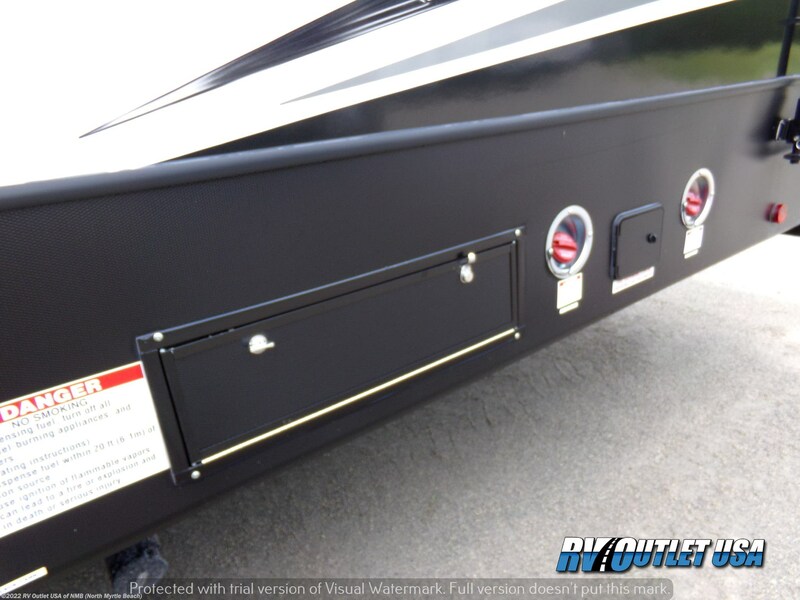 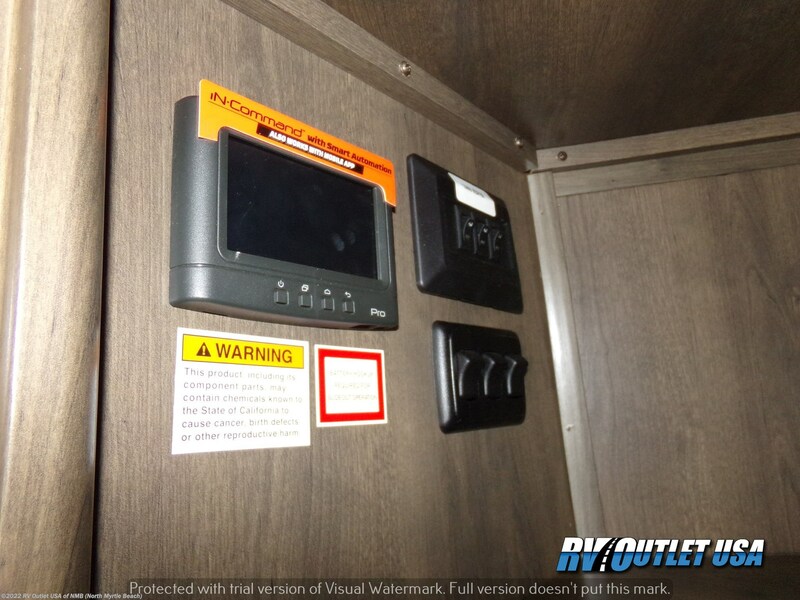 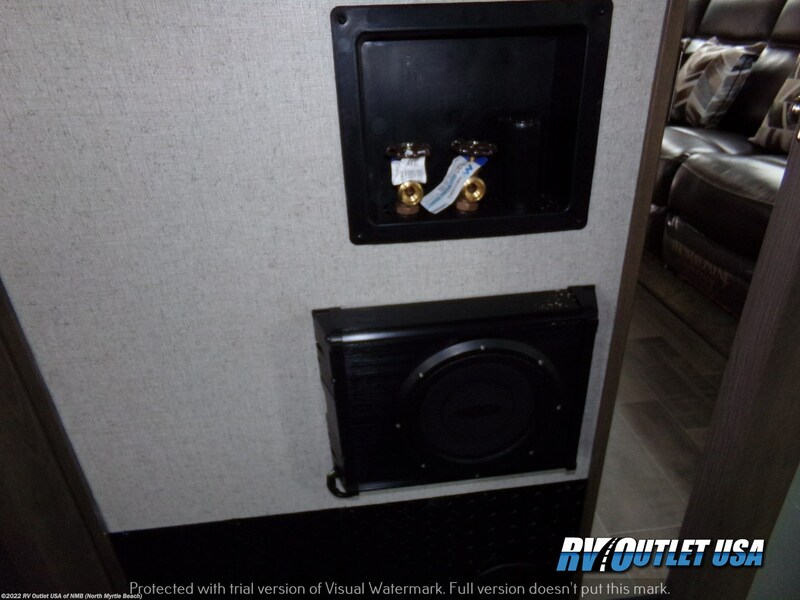 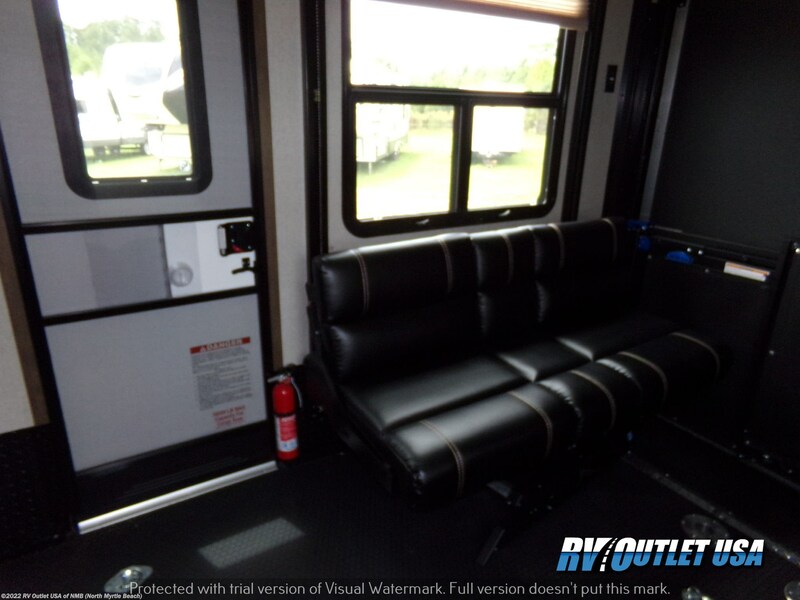 The cargo area is 14' and has a LCD TV, the power beds with opposing couches, and this 2019 Voltage 3805 has the new style frame mounted ramp door.! 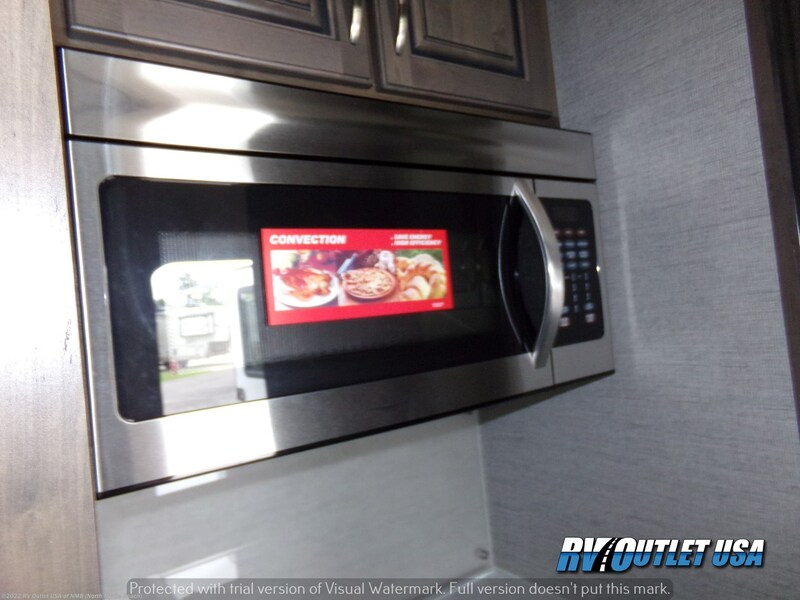 As you can see, it's got a lot of very nice options and features! 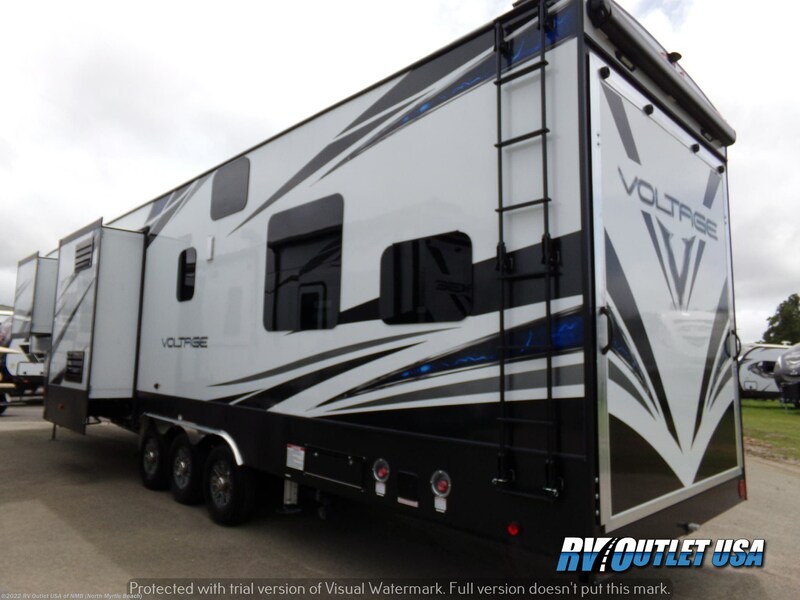 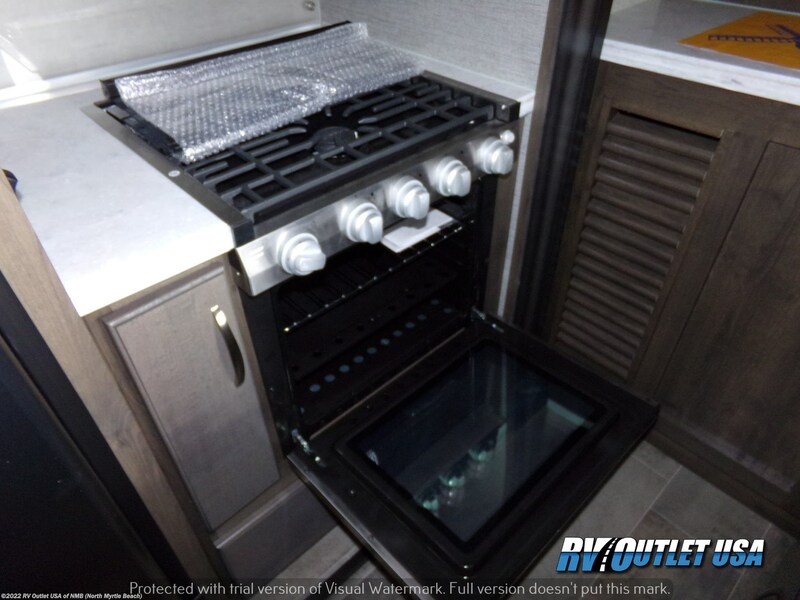 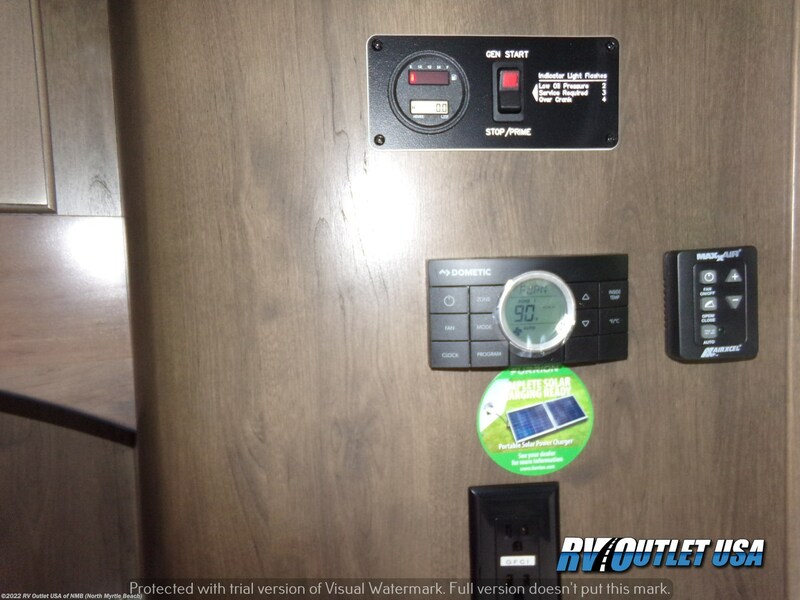 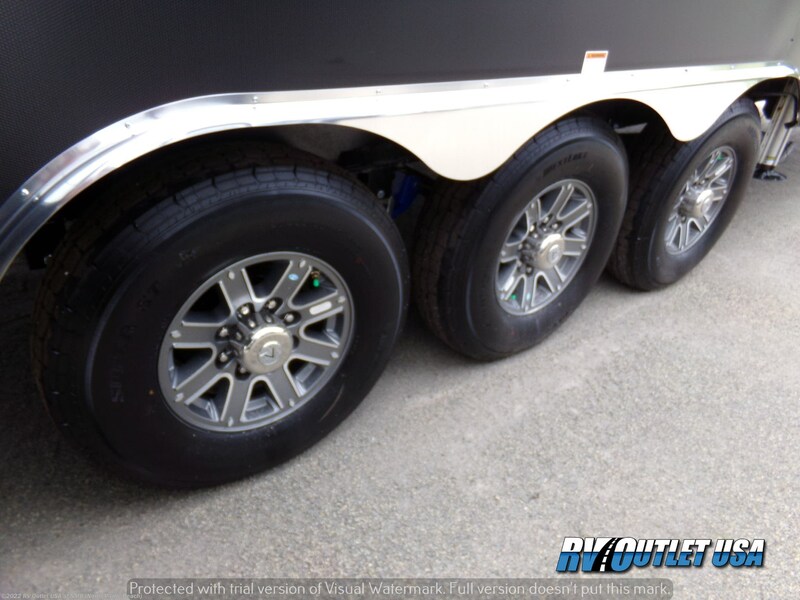 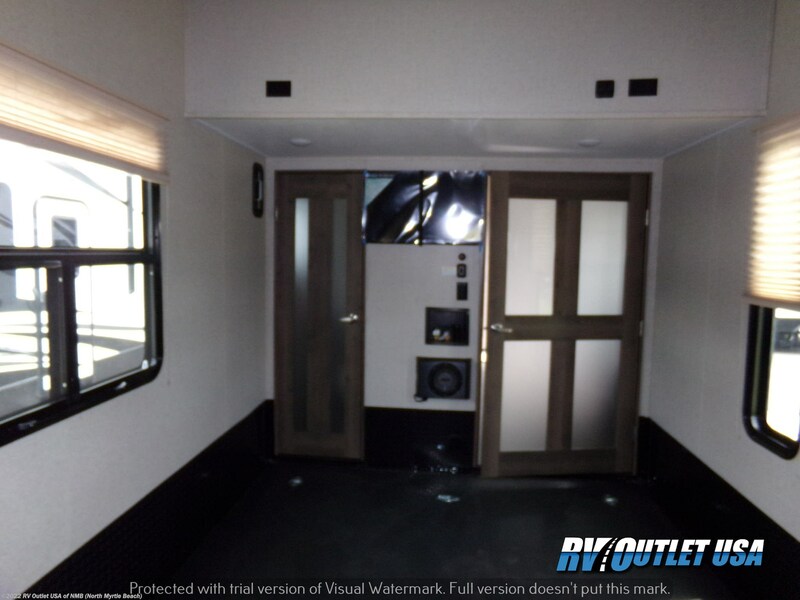 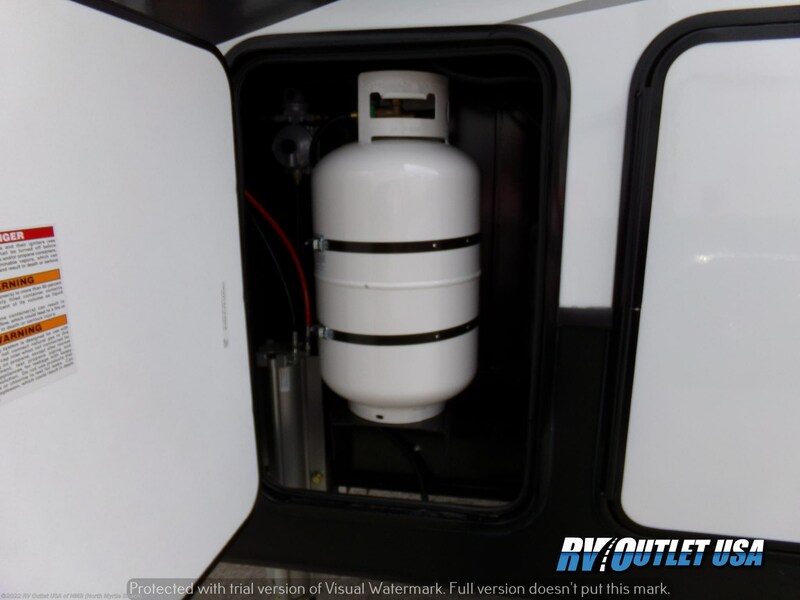 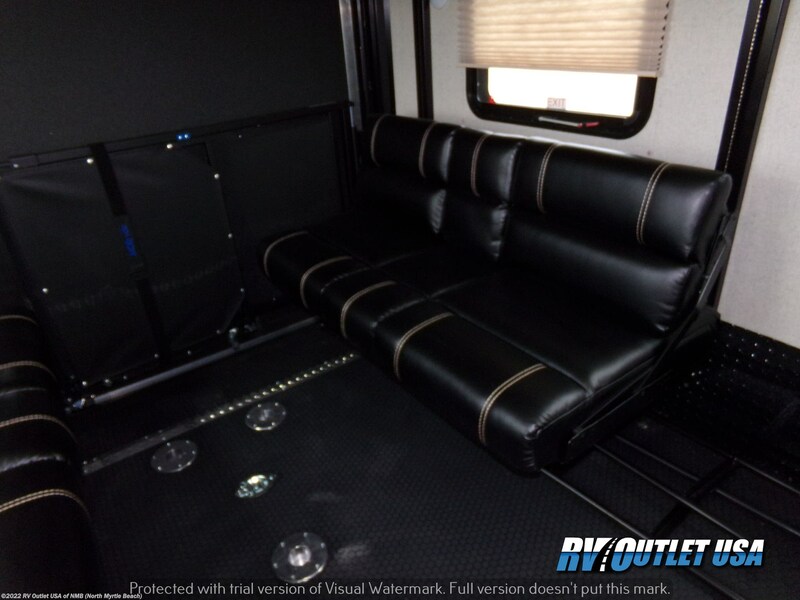 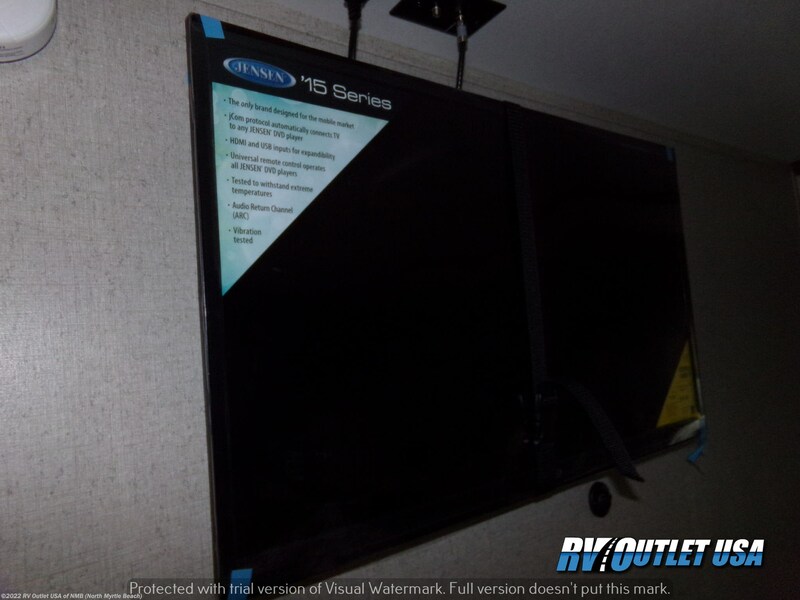 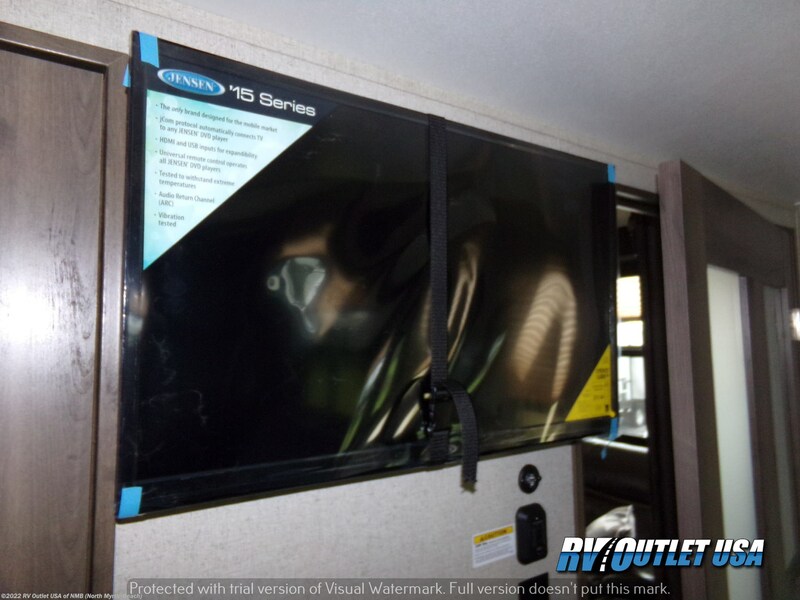 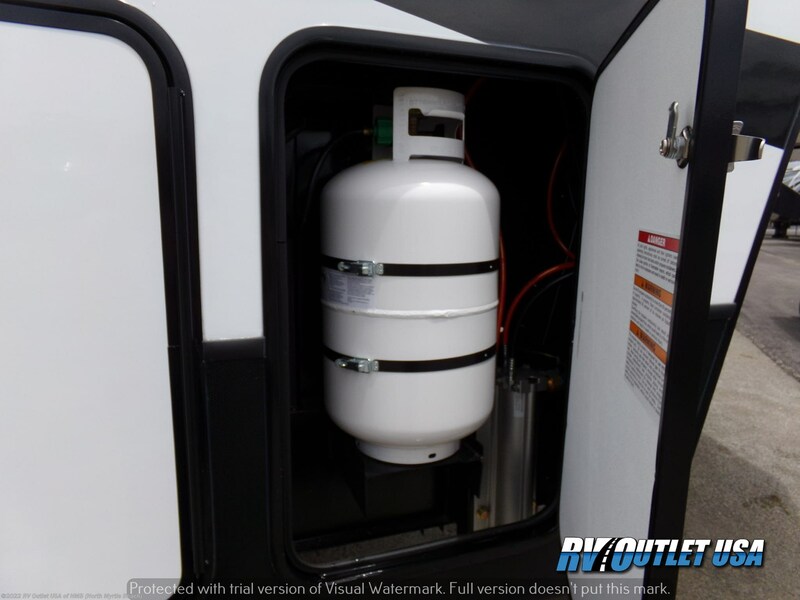 Here's a list of options that were ordered on this Voltage 3805 5th wheel toy hauler. 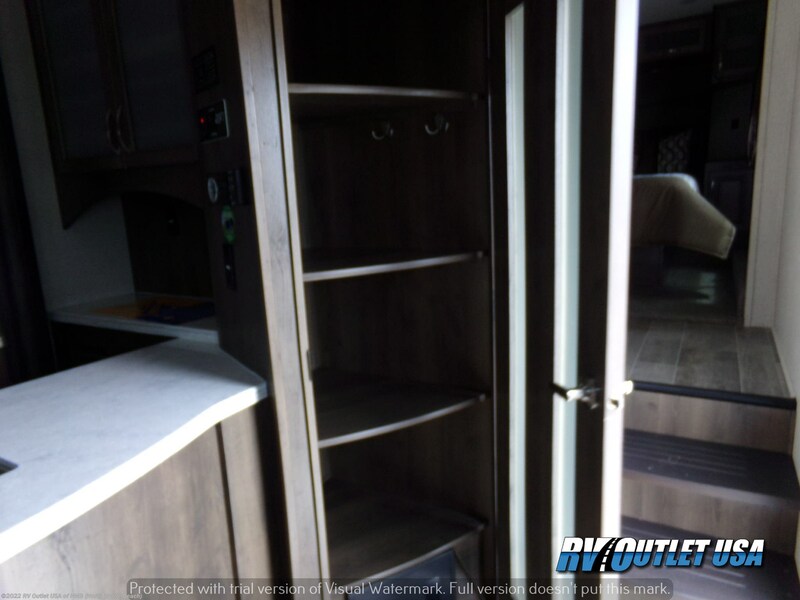 The interior color is hazel, it has the Voltage Luxury package, the Voltage Interior package, the Voltage Exterior package and the Voltage Convenience package. 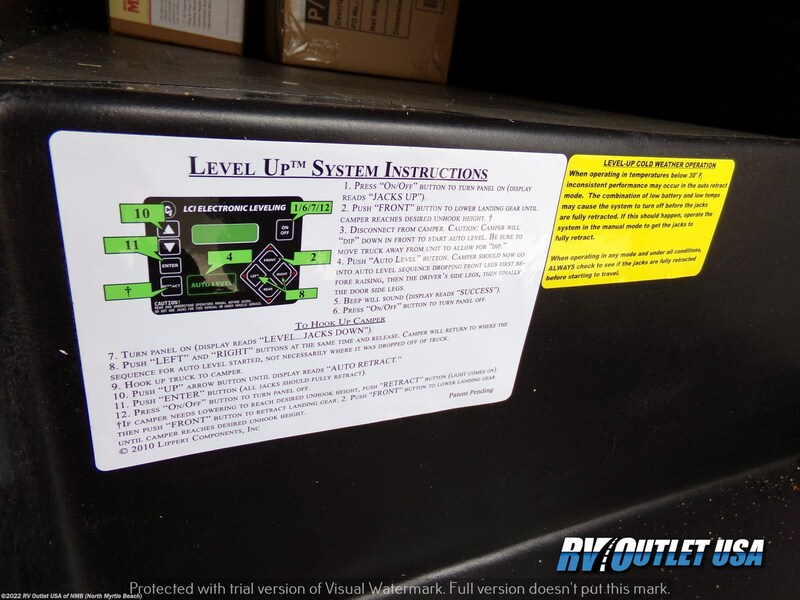 All (3) of these packages contain a TON of super nice features! 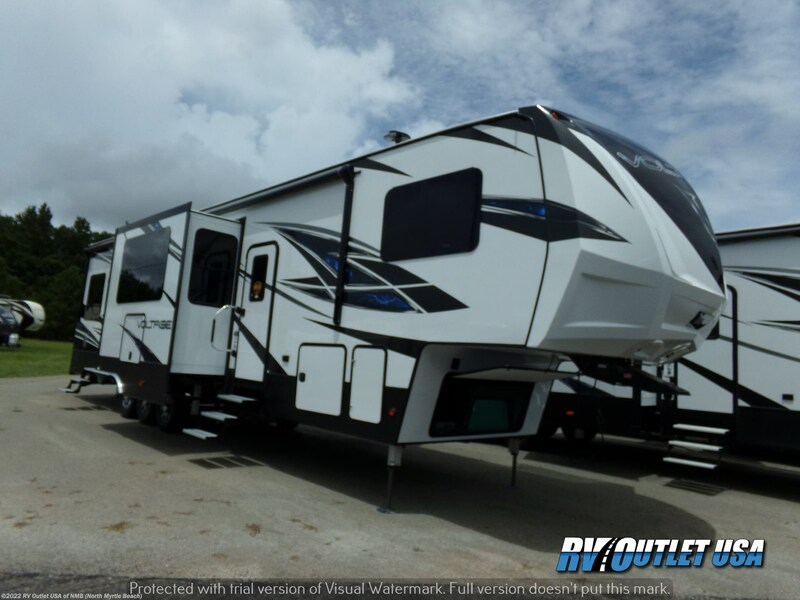 Additional options are, the power rear beds with dual opposing couches, a (4) door refer, the outside entertainment center, dual lighted power awnings, a 5500 Onan generator with fueling station, high gloss exterior and painted front cap, the new style frame mounted ramp door, (3) A/C's, a central vacuum system, leveling system! 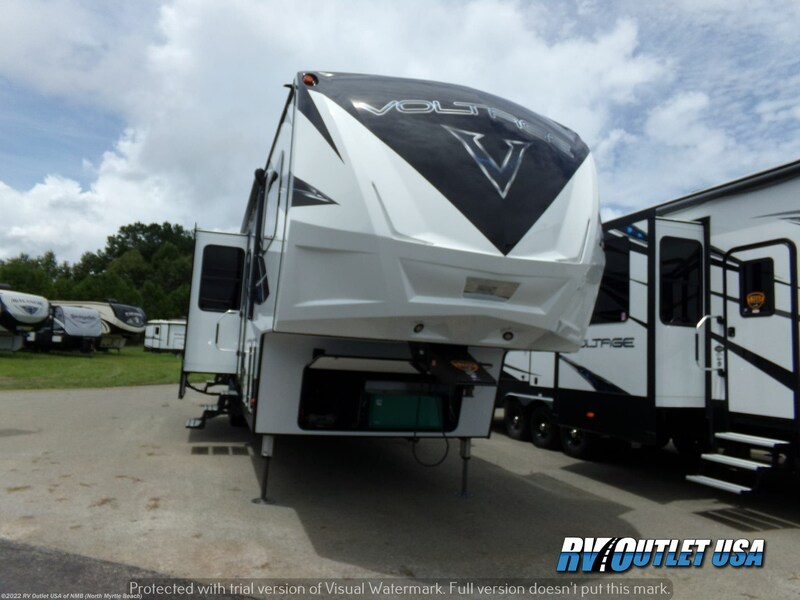 This 2019 Dutchmen Voltage 3805 is loaded!! 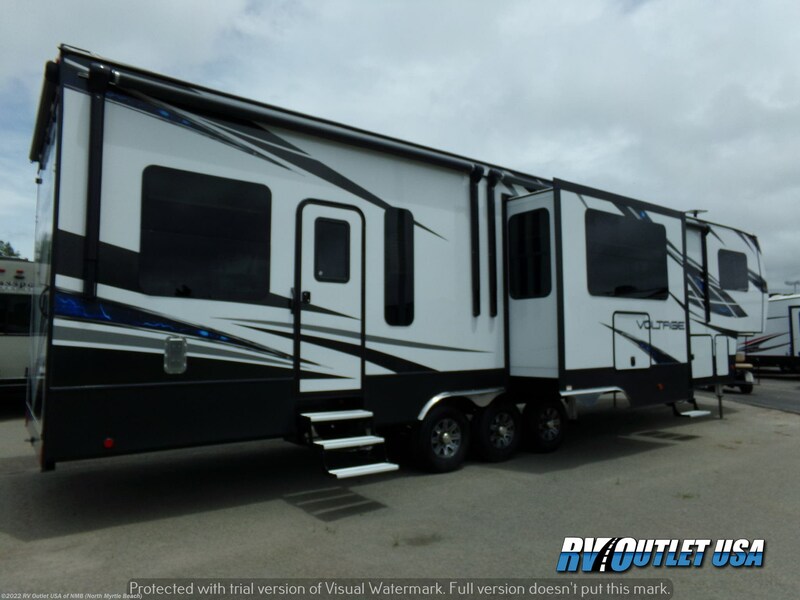 If you have any questions, please feel free to give us a call at 843-756-2222, and ask for sales. 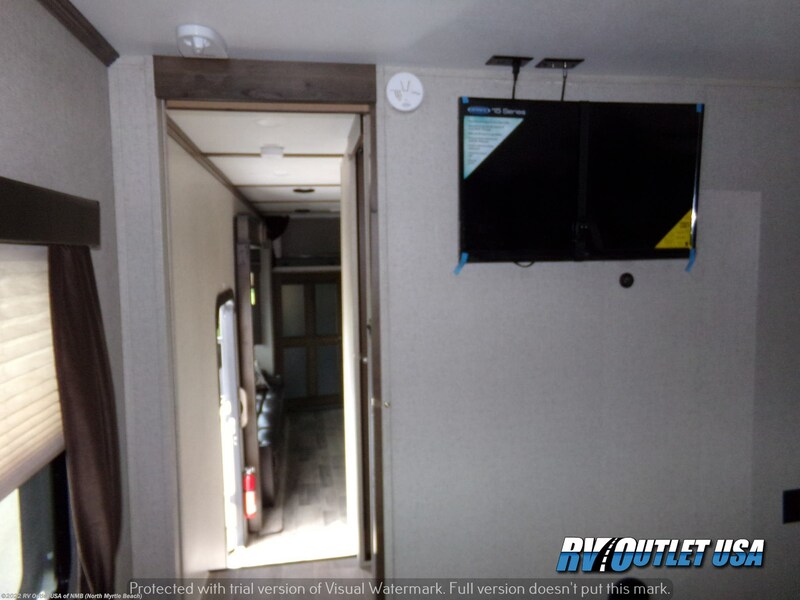 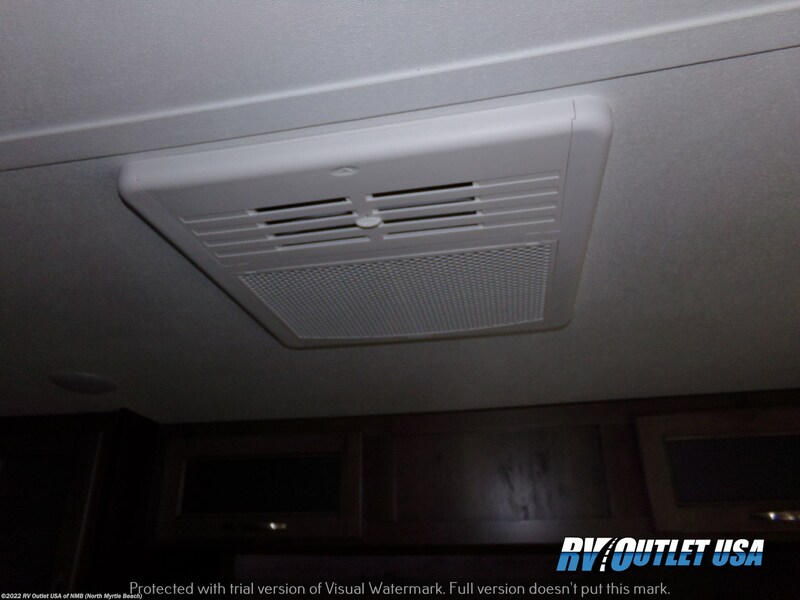 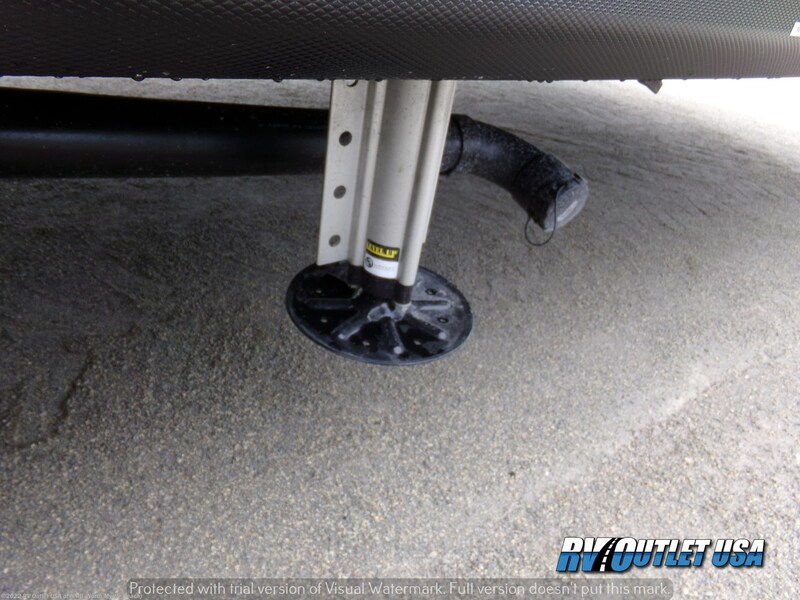 You can also email us at rv007(dot)com, and our direct website is rvoutletusa(dot)com Please keep in mind, we have NO doc or prep fees and we offer HUGE discounts to our customers on 5th wheel hitches, parts and accessories. 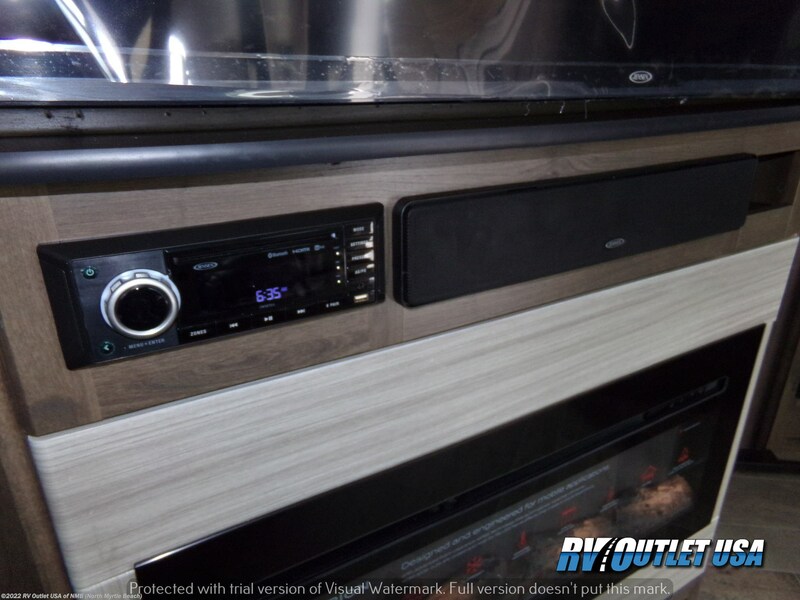 We also have the best financing around!